The 953 MW Huntly Power Station is New Zealand's largest power station by capacity. This station is located close to major population centres, has reliable access to cooling water, coal and gas resources, and benefits from limited transmission constraints. This, together with long-term resource consents, means that the Huntly Power Station is expected to continue to provide Genesis Energy with both a valuable asset and a range of future development options. The Huntly Power Station has the ability to provide base-load generation while also being able to take advantage of higher prices in the short or medium term. The mix of generating units is likely to change over time as older gas/coal-fired generation units are placed into long-term storage, retired or replaced. In addition, the Huntly Power Station plays an important role in supporting financial contracts offered by the Company to other retailers and large customers as dry period 'insurance', and in providing ancillary services such as frequency and voltage support. A description of the generating units at Huntly Power Station can be found below. Huntly Unit 5 (previously known as e3p; Energy Efficiency Enhancement Project) uses natural gas as its fuel source, and is able to generate up to 403MW of electricity - enough to power approximately 400,000 households. The high efficiency gas – fired unit was commissioned in June 2007. The unit is a high-efficiency combined cycle generator consisting of three major components. The Rankine Units utilize boiler and steam turbine technology and are capable of using coal and gas to generate electricity. The two Rankine Units currently in service were commissioned between 1982 and 1985 and can each generate 250MW. These units have the capacity to operate in a range of roles, including Base-load, Hydro-firming and Peaking. Unit 6 is a 50.8MW open cycle gas turbine, which was commissioned in 2004. This unit can burn 100% gas or diesel to generate electricity. Unit 6 is operated as a Peaking unit when wholesale electricity prices reach high levels or when it is economic to operate it over short periods. Genesis communicates its environmental performance with stakeholders on a regular basis. In May 2012, 25 year resource consents were granted for the generation capacity at Huntly which secure the site's future as a long-term generation site of national significance. This reflects its critical role in supplying electricity and important ancillary services such as frequency and voltage support. The Huntly Consultative Group (incorporating West Mine Residents) meets on a regular basis, in the Seminar Rooms at the Huntly Power Station. The meetings are attended by local iwi, neighbours, members of the community and staff from various organisations such as the District and Regional Councils. These meetings function as an information forum for the local community allowing Genesis to communicate with its stakeholders about various activities at the Huntly Power Station. Further information and dates of future Huntly Consultative Group Meetings can be obtained from the Huntly Power Station on 07 828 6800. Genesis has also undertaken extensive planting around the Huntly Power Station site in order to reduce the visual impact of the station and the activities at the site on the surrounding environment. The lower Waikato River is a national and regional icon holding significant cultural, economic, social and environmental values. Through resource consents commitments, relationships with local stakeholders and involvement in Waikato Rivercare Genesis contribute to activities that aim to enhance these values. The earliest projects commenced in 1995 as an obligation under Huntly Power Stations superseded resource consents. The photos above illustrate the changes at one of the enhancement sites on the Hakarimata Range. As a commitment under Genesis's current resource consents three projects were commenced in 2014 including additional improvements at the Tuna (Eel) Enhancement site, fencing and restoration of the north-western channel of Taipouri Island and Waikato River bank restoration at Hopuhopu. The Tongariro Power Scheme has a catchment area of more than 2600 km2in the North Island's central volcanic plateau. The 361.8MW hydro scheme comprises three power stations – Rangipo (120MW, underground), Tokaanu (240MW) and Mangaio (1.8MW). The 361.8MW Tongariro Power Scheme has a catchment area of more than 2600 km2 in the North Island's central volcanic plateau. The scheme gathers water from the mountains of the central plateau through Eastern and Western Diversions of the Scheme. The water passes through a series of pipes, lakes, canals and tunnels to the Mangaio, Tokaanu and Rangipo hydro power stations before entering Lake Taupo. The Tongariro Power Scheme can be divided into four key sections the Eastern Diversion, Western Diversion, Tongariro Section and Rotoaira Section. The Eastern Diversion extends from the Wahianoa Aqueduct on the southern flanks of Mt Ruapehu, eastward to the Moawhango Dam and north to the discharge point of the Moawhango Tunnel at the Rangipo Dam on the Tongariro River. The major structures in the Eastern Diversion and their purposes are outlined below. Takes water from tributaries of the Whangaehu River via 22 intakes and delivers it to Lake Moawhango. The Whangaehu River itself is not intercepted as it is naturally acidic, draining from the Crater Lake on Mt Ruapehu. The aqueduct is approximately 8,400m long and is buried underground. It transports water eastward under the Whangaehu River and into the Mangaio Tunnel. Water from the Wahianoa aqueduct passes under the Desert Road through the Mangaio Tunnel and either into Mangaio Power Station or a drop structure to enter the Lake Moawhango via the Mangaio Stream. Construction of the Mangaio Power Station began in January 2007 and commissioning began at the end of 2008. When operating, the power station will provide additional generation to the Tongariro Power Scheme of approximately 1.8MW's of electricity. The Moawhango Dam dams the Moawhango River and Mangaio Stream to create Lake Moawhango. Lake Moawhango has a normal operating range of approximately 15.2 metres and as such rarely spills except during the largest floods. Water is taken from Lake Moawhango to the upper Tongariro River by a 19.2km tunnel. The tunnel flow is regulated by a discharge valve at the downstream end of the tunnel where it discharges into the Tongariro River, at Rangipo Dam. The Western Diversion begins at the Whakapapa River where the water is routed north east via a 16.5km tunnel into Lake Te Whaiau. There are 4 smaller intakes into this tunnel which intercept water from the Tawhitikuri, Okupata, Taurewa, and Mangatepopo streams. Water is also diverted from the Whanganui River into the Te Whaiau Stream, which in turn discharges into Lake Te Whaiau. From Lake Te Whaiau water is discharged into Lake Otamangakau which is then discharged into Lake Rotoaira via the Wairehu Canal. The Whakapapa Intake comprises a concrete gravity dam set into the river bed just below the confluence of the Papamanuka Stream and the Whakapapa River. The intake has a flow capacity of 35 cubic metres per second. Any flow above this amount is passed over the spillway and down its natural course. A minimum flow of 3m3/s is maintained in the river downstream of the intake. Recreational flows are also released from the intake periodically. A minimum flow downstream of 0.5m3/s is released downstream of Mangatepopo Intake. The Whanganui Intake diverts water from the Whanganui River via a short tunnel into the Te Whaiau Stream, which then flows into Lake Te Whaiau. A minimum flow of 0.3 m3/s is maintained below this intake constantly. Lake Te Whaiau Canal receives water from the Whakapapa - Tawhitikuri - Whanganui Tunnel and the Te Whaiau culvert. The dam spillway discharges into the old Te Whaiau stream bed. The Otamangakau Canal links Lake Te Whaiau to Lake Otamangakau. Lake Otamangakau provides short term storage for the western diversion flows. The Wairehu Canal takes water from Lake Otamangakau to Lake Rotoaira. Here it combines with the inflows from the Eastern Diversion. The Tongariro Section begins at the Waihohonu Intake and Tunnel, which transport water from the Waihohonu Stream to the Rangipo Dam on the Tongariro River. It then extends from the Rangipo Dam northward as far as the Poutu Intake, then North West to the Poutu Tunnel and Poutu Canal as far as the Poutu Dam. Waihohonu Intake and Tunnel takes water from the Waihohonu Stream via a 960 m long tunnel to the Rangipo head pond. The Tongariro River creates a head pond for the Rangipo Power Station. Water is transported from here to the Rangipo Power Station via a headrace tunnel. A minimum flow of 0.6 m3/s is maintained below the dam to enhance the Blue Duck habitat. Recreational flows are also released from here periodically for sporting activities. For more information view our Rivers, Lakes and Rainfall section. The Rangipo Power Station is 63 m below the ground and was the second underground power station to be built in New Zealand. Rangipo was built underground to minimise the visual effect of the power station on the surrounding environment and the Tongariro River. Rangipo power station has two 60MW generators, and was commissioned in 1983. The Rangipo Tailrace Tunnel discharges water from the Rangipo Power Station after electricity generation, through a 3 km tunnel to the Tongariro River, immediately upstream of the Poutu intake. The Rotoaira Section is the northern-most section of the scheme. It includes Lake Rotoaira, the Tokaanu Intake and Tunnel, Tokaanu Power Station and Tokaanu Tailrace. Lake Rotoaira lies at an altitude of approximately 564m asl between Mt Tongariro and Mt Pihanga, south west of Lake Taupo. The lake is the reservoir for the Tokaanu Power Station. Conveys water from the Poutu Dam to Lake Rotoaira. Tokaanu intake is at the northern end of Lake Rotoaira. Here the water enters a 6.1 km Tunnel to Tokaanu Power Station. The Tokaanu Power Station is a 240MW capacity station situated on the base of Mount Tihia at the southern end of Lake Taupo. Water from the power station passes into the Tokaanu Tailrace channel, a 3.8km channel that discharges into Lake Taupo at Waihi Bay, west of the Tongariro Delta. The Tokaanu stream diversion was created to preserve the Tokaanu stream (an important trout spawning stream) which crossed the path of the power station tailrace. The stream still crosses the path of the tailrace, but via an aqueduct under the tailrace road bridge. Resource consents are required for a number of activities related to the operation and maintenance of the Tongariro Power Scheme. The current operative resource consents for the Tongariro Power Scheme were granted in 2004 for a duration of 35 years, expiring in 2039. Genesis produces an annual compliance monitoring report for the Tongariro Power Scheme which is provided to Councils, in addition to other consent monitoring and reporting requirements throughout the year. An annual consultative meeting is held at Tokaanu Power Station. These consultative meetings function as an information forum for the local community allowing Genesis to communicate with its stakeholders about various activities at the Tongariro Power Scheme. Genesis has a Rivers, Lakes & Rainfall section on this website to ensure that critical details which relate to the water levels in its hydro schemes are always available for the public. Genesis has ongoing mitigation responsibilities in relation to the consented activities at the Tongariro Power Scheme. Genesis's Environmental Management Framework details the companies approach to environmental management including mitigation. In the early 1990s, ECNZ (Genesis's predecessor) began work to renew its resource consents for the Tongariro Power Scheme (TPS). This initiated a lengthy process of consultation with many parties, including the Department of Conservation (DOC) and the Royal Forest and Bird Protection Society (Forest and Bird). DOC and Forest and Bird were concerned primarily with the effects of the TPS on the environment and especially the impact of the TPS on the blue duck and their habitat, and on the natural character of rivers and streams. Whio are regarded as an indicator of healthy stream ecology. DOC, Forest and Bird and Genesis agreed to a mitigation package that included the release of minimum flows below the Mangatepopo and Whanganui intakes on the Western Diversion of the TPS and the establishment of the Central North Island Blue Duck Charitable Trust. The Trust provides for ongoing initiatives to enhance, protect and promote Whio populations, habitat and natural character. The Trust was launched on 16th August 2002. For more information on the Trust, funding and Annual Reports go to the Whio Forever website. The Whanganui River has great intrinsic, cultural and recreational value. However, over the last century the water quality and appearance of the river has degraded, mainly due to increased sediment load from farmland, land which was previously bush. The catchment is steep and unstable and heavy rainfall often triggers slips. Flow in the Whanganui River is also reduced by water extraction by the Tongariro Power Scheme which diverts flow from head-water rivers for electricity generation. As part of the process to renew the resource consents for Tongariro Power Scheme (TPS), new minimum flows were implemented and the Wanganui District Council (WDC), Genesis and the Ruapehu District Council (RDC) entered into a formal agreement on 31 May 2002 to establish a Trust to provide resources to mitigate effects of the ongoing operation of the TPS. The Whanganui River Enhancement Charitable Trust was established in 2003 and the six current Trustees are Cr Warren Furner (Chairman) and Cynthia Dowsett from RDC; Cr Sue Westwood and Julian Harkness from WDC; while Cam Speedy and Dave Pellowe represent Genesis. The Trust's purpose is to promote and encourage the enhancement of the quality of the waters and catchments of the Whanganui River. The Trust is working with Horizons Regional Council on a water quality enhancement project focused on priority catchments of the Whanganui River. The proposal aims to help farmers manage erosion by preparing and implementing farm plans in the Waikaka and Ohura catchments and commenced in 2005. The Trust is also working with the Catalyst Group on a project to improve water quality in the Piopiotea and Kakahi Stream catchments in the upper-Whanganui. The Trust provides annual funding for social, economic and environmental enhancement projects in the Whanganui Catchment. To date, the Trust has provided funds to river enhancement projects for activities such as riparian fencing and planting, the Pipiriki boat ramp repairs, the Upokongaro jetty construction and the Wanganui Waterfront Project. The Trust also provides student scholarships. 2018 Applications for Funding Assistance. Applications for 2018 funding assistance close on Thursday the 12th April. In July 2002, Hillary Outdoors (formerly OPC) and Genesis agreed on a mitigation package to offset the adverse effects of the Tongariro Power Scheme on recreational amenity values. As part of the package a fund was formed to assist Hillary Outdoors to provide kayak education to young New Zealanders. The fund is managed by a joint Genesis and the Hillary Outdoors committee, operating under the umbrella of the Hillary Outdoors Charitable Trust. The aim is to encourage young people into the sport of kayaking in the central North Island though high-quality instruction. Providing funding for kayak instructors to travel to other organisations/areas to enhance their skills and utilise these in New Zealand. Genesis recognises that it is not appropriate to simply address the effects of its operation based on resource consent and mitigation requirements. We are therefore striving to create a more holistic approach to our environmental management, whilst still maintaining our commitment to the local community. The key environmental initiative at the Tongariro Power Scheme is the education programme at Tongariro National Trout Centre near Turangi. In 2013 Genesis renewed a sponsorship agreement with the Department of Conservation (DOC) and the Tongariro National Trout Centre Society for a further three-year term. The sponsorship agreement is primarily focussed on the Taupo for Tomorrow education programme and also provides additional funding for advocacy at the wider Tongariro National Trout Centre. The education programme has been running since 2004 and Genesis has been the primary sponsor since this time. Run by Department of Conservation educator, Mike Nicholson, the programme offers schools the opportunity to have a hands-on learning experience at the Trout Centre aimed at building their understanding of fresh water ecology. Catering for Year 1 to 13, the programmes are customised when necessary to fit the needs of the students and are linked to the National Curriculum. All programmes are based upon the theme of sustainability in relation to the Taupo fishery resource and associated freshwater environments. Over 3,000 students participate in the programme each year. In addition to this, Mike is involved in the LEARNZ on-line virtual reality field trips which reach out to thousands of learners throughout the country. "There is no more rugged breed of man than the New Zealand tunneller...... a tough, phlegmatic individual devoted to his craft and dedicated to the task on digging into the earth so that people on the surface can enjoy the benefits of modern science." Underground - Tunnelling for Power is the story of Kiwi and the many immigrant Itallian tunnellers who worked in some of the most difficult and hazardous conditions imaginable to drive the 50 km of tunnels and build the vast underground power station at Rangipo. The film features many of the underground workers telling their personal stories of their experiences, their challenges and the special camaraderie that developed amongst these men which still lasts to this day. DVD's cost $40 each and can be purchased from John Ball. Phone 07 386 5138 or email [email protected]. Kerry Scott, a civil engineer, originally from Scotland arrived in Turangi, NZ in 1957. He spent the next 25 years working on the Tongariro Power Development, one of the countries largest civil engineering projects. As Investigations Engineer, then Resident Construction Engineer and finally Project Construction Engineer. Kerry dedicated his life to this huge project. Kerry made Turangi, a brand new town his home, becoming an integral part of the community and was awarded an OBE in 2008 for his services to soccer. DVD's can be purchased for $40 each from John Ball. The Ngati Tuwharetoa Genesis Committee was formed after an agreement was reached between the Tuwharetoa Maori Trust Board (on behalf of nga hapu o Ngati Tuwharetoa) and Genesis in 2000. The purpose of this agreement is to mitigate the impacts of the ongoing operation of the Tongariro Power Scheme (TPS) on Ngati Tuwharetoa, and establish a forum whereby a meaningful, positive and balanced working relationship is developed. This agreement came about after many years of direct consultation with hapū that involved discussions around complex and difficult issues. The Waikaremoana Power Scheme is located between Te Urewera National Park and Wairoa, along the upper 7km of the Waikaretaheke River. The 138MW hydro scheme comprises three power stations – Kaitawa (36MW), Tuai (60MW) and Piripaua (42MW). Water is taken from Lake Waikaremoana via tunnels to Kaitawa Power Station, before being discharged into Lake Kaitawa. Water is then passed through Tuai Power Station and discharged into Lake Whakamarino. From there, water is carried by tunnel to Piripaua Power Station and is discharged into the Waikaretaheke River. The 138MW Waikaremoana Hydro Scheme comprises three hydro power stations – Kaitawa (36MW), Tuai (60MW) and Piripaua (42MW). Lake Waikaremoana was created approximately 2200 years ago by a massive landslide which dammed the Waikaretaheke River. The natural outflow of the lake was originally leakage through the natural dam. In the 1950s, an attempt was made to seal some of the leaks and occasional surface flow over a natural crest to the Waikaretaheke River when the lake level was high enough in the bed of Lake Waikaremoana, to allow more water to pass through Kaitawa Power Station. Kaitawa Power Station, commissioned in 1949, was the last power station to be constructed as part of the Waikaremoana Power Scheme and generates a maximum output of 36MW. The station was constructed upstream of Tuai Power Station, alongside Lake Kaitawa, and is supplied with water directly from Lake Waikaremoana via tunnels driven through the natural dam. Previous to Kaitawa Power Station being developed, the stations at Tuai and Piripaua had only utilised water that naturally flowed out of Lake Waikaremoana by leakage or crest flow. The development of Kaitawa Power Station meant that water was taken directly from Lake Waikaremoana. Water from Kaitawa Power Station is discharged into a short canal and into Lake Kaitawa for use in two power stations downstream. Spillway structures also allow water to pass into the Waikaretaheke River. Water can also be taken from Lake Waikaremoana via either the siphon system or spillway, both of which discharge water into the Waikaretaheke River. The siphon system is used either to bypass Kaitawa Station when it is not generating (the water can be used downstream in Tuai and Piripaua Power Stations), or when it is necessary to contain rising lake levels. Lake Kaitawa was originally a small spring-fed lake and wetland. However, the construction of an earth dam and weir across the Waikaretaheke River in the mid-1930s allowed the water level to be raised by 3 metres, converting it into a permanent lake. The lake today is the operational headpond for Tuai Power Station and is fed by water diverted from the Waikaretaheke River, which also has a number of springs that flow directly into it. Lake Kaitawa has an operating range of 2.6 metres. The Tuai intake, through which water is taken to Tuai Power Station, is located on the eastern side of Lake Kaitawa. Tunnels and penstocks carry water to Tuai Power Station. Tuai Power Station has the highest head and generates the largest proportion of the Waikaremoana Power Scheme's total output. The station has a maximum output of 60 MW. Water is discharged from the Tuai Power Station turbines into Lake Whakamarino. This lake was created by construction of an earth dam across the Kahuitangaroa Stream. The earth dam contains a spillway structure and a sluice gate structure. The spillway structure incorporates an automatic tipping gate, which allows water to pass directly down the Kahuitangaroa Stream. Water is released here into the Kahuitangaroa Stream, which joins with the Waikaretaheke River a short distance downstream. The Piripaua intake is located at the south-eastern side of Lake Whakamarino. Piripaua Power Station is located in the bed of the Waikaretaheke River. The residual Waikaretaheke River is diverted around the station and rejoins its original course approximately 200 m downstream. Water discharged from the station's turbines flows into the natural riverbed via a tailrace. Piripaua Power Station was commissioned in 1943. Resource consents are required for a number of activities related to the operation and maintenance of the Waikaremoana Power Scheme. The current operative resource consents for the Waikaremoana Power Scheme were granted in 1998 for a duration of 35 years, expiring in 2032. Genesis produces an annual compliance monitoring report for the Waikaremoana Power Scheme which is provided to Council, in addition to other consent reporting and monitoring requirements throughout the year. An annual consultative meeting is held at Tuai. These consultative meetings function as an information forum for the local community allowing Genesis to communicate with its stakeholders about various activities at the Waikaremoana Power Scheme. The Tekapo Power Scheme has been owned and operated by Genesis since 1 June 2011. The 187MW hydro scheme is located at the head of the Waitaki Valley in the Mackenzie District of the South Island. Water is taken from Lake Tekapo through an intake tunnel and generates electricity through Tekapo A Station (30MW). Outflows from Tekapo A flow through the Tekapo canal before entering Tekapo B Power Station (160MW). Tekapo B sits in the bed of Lake Pūkaki, with outflows entering the lake directly. Lake Tekapo is the source of water for the entire Tekapo Power Scheme. The lake is dammed by the Lake Tekapo Control Structure at the head of the Tekapo River which also forms the bridge over the river at State Highway 8. Construction of Tekapo A began in 1938 but was halted between 1942 and 1944 as labour and materials were diverted to World War II. The station was finally commissioned in 1951. Tekapo A Power Station generates electricity from water diverted from Lake Tekapo via a 1.4 kilometre intake tunnel. In 1970 a 25.5 kilometre canal was constructed to take outflows from Tekapo A to Tekapo B. The Tekapo Canal has a maximum capacity of 130 cubic metres per second. Water in Lake Tekapo can bypass Tekapo A Power Station via water releases through the Lake Tekapo Control Structure (State Highway 8 bridge at Tekapo). When the control gates are open water flows down the upper Tekapo River to Lake George Scott. Water can then be released into the Tekapo Canal via a gate in the control structure that impounds Lake George Scott. Commissioned in 1977, Tekapo B is the only power station in New Zealand completely surrounded by water. Sitting in Lake Pukaki, esentially as an island, the station is connected to land via a 74 metre long bridge and boasts outstanding views of Aoraki Mt Cook. Constructed on huge concrete raft foundations, Tekapo B is 46 metres high. However, nearly two thirds of the power station is below the waterline. The station is powered by water from the Tekapo Canal with outflows entering Lake Pukaki. This same water then passes through a further six power stations within the Waitaki Catchment. Genesis holds a number of resource consents which allow for the operation of the Tekapo Power Scheme. Monitoring and reporting to ensure compliance with consent conditions forms a significant part of the operation of the scheme. Genesis also has mitigation agreements in place to manage its effects on the environment. In addition, environmental initiatives have been set up to enhance the surrounding environment and these are over and above the consent related legal obligations. Genesis produces an annual compliance monitoring report for the Tekapo Power Scheme, which is provided to Council, in addition to other consent reporting requirements throughout the year. An annual community meeting will be held at Lake Tekapo. These meetings are usually held in October and are notified to as many interested parties as Genesis is aware of. Toilet and car parking facilities are provided at both ends of the Tekapo Canal - please use them. Boating, swimming, overnight camping and fires are prohibited. Gates and bicycle "squeeze" barriers are installed along the length of the Tekapo Canal to allow access to the south side of the Canal, providing cyclists and walkers an alternative scenic access from Lake Tekapo to Lake Pukaki. Vehicle access to the canal road for the public is maintained to around 7 km downstream of Tekapo A Power Station, and also around the head pond above Tekapo B Power Station to a point about 4 km upstream of the head pond. We take precautions to close the road during periods of high winds and adverse weather conditions or for operational purposes. Pukaki Irrigation Infrastructure Partnership has commenced the construction of an Off-Take Structure along the Tekapo Canal, just upstream of the Tekapo B headpond. This work requires construction traffic including excavators and a mobile crane. Safety of the public as well as staff is paramount, and safe working requires exclusion of the public from the construction areas. The construction will involve a road closure period commencing from Tuesday 20 February 2018 and ending on Monday 27th August 2018, which has now been completed. Genesis has commenced with a project to construct, operate and maintain a new Intake Gate for the Tekapo A Power Station adjacent to the southern shoreline of Lake Tekapo. 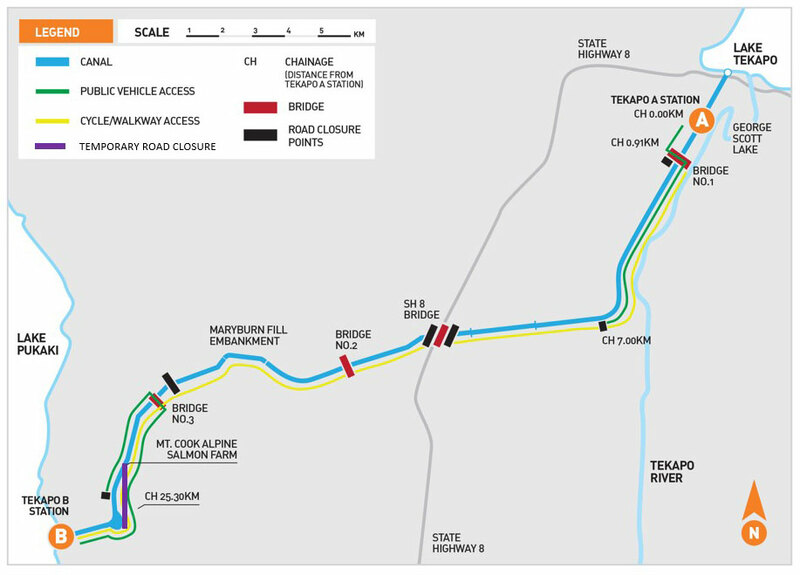 The Intake Gate will be located on the existing tunnel alignment that conveys water from Lake Tekapo to the Tekapo A Power Station. The Intake Gate will provide the ability to stop flow through the intake under full load conditions in an emergency. Genesis hold a suite of resource consents from Mackenzie District Council and Canterbury Regional Council enabling the construction, maintenance and operation of the new intake gate for the Tekapo Power Scheme. Construction activities are being undertaken in the area identified in Figure 1. Initial site works to be undertaken over the period April – September 2019 will include the erection of security fencing around the site, demolition of the existing pump house and installation of a retaining wall behind where the new Intake Gate building is to be located. An existing walk and cycle pathway passes through the Project area, which will need to be closed during construction. To minimise disruption to users of this passage, a temporary footpath will be established along the south-side of Lakeside Drive for approximately 500 metres. The temporary footpath will be constructed prior to the Project area being fully enclosed and be delineated by “footpath closed please use other side” signage at each end at the fence surrounding the site. A number of construction vehicle movements will be required to enable the construction of the Project. In particular, construction traffic will be necessary to enable the removal of spoil material, the delivery of concrete, construction materials (e.g. reinforcing, structural steel and electrical items) and personnel. Information signage will be erected onsite at the eastern and western ends of the construction management area outlining details of the project works. A dedicated project enquiries phone line 0800 846 8253 and e-mail address [email protected] is available to facilitate any questions or feedback relating to the project. Hau Nui wind farm is situated in the South Wairarapa and has 15 wind turbines. The wind farm was constructed in two stages. Stage 1 was constructed at the northern end of Range Road in 1996 and Stage 2 was completed in 2004. Hau Nui uses renewable wind energy to generate electricity for supply to consumers via the local Wairarapa network, and at times via the national grid. The wind farm provides enough power for around 4,200 homes in the Martinborough area, and depending on demand and output, as far as Greytown. Hau Nui has the capacity to generate 7.3MW and there is potential for further development in the future. The South Wairarapa area is recognised for its significant wind energy potential, and the Hau Nui site is acknowledged as one of the best wind farm sites in the world. The May 2001 Energy Efficiency and Conservation Authority report "Review of New Zealand Wind Energy Potential to 2015", cited the Wairarapa Hills and Coast area as having the second highest potential energy output in New Zealand. The area could provide up to 12% of the New Zealand wind energy potential, and is second only to the Foveaux Strait and South East Hills area in the South Island. Hau Nui has 15 Enercon E-40 wind turbines. The seven turbines installed in stage 1 (1996) are third-generation wind-energy technology and the additional eight turbines installed in stage 2 (2004) are later versions of this model. The E-40 is a variable-speed machine. The rotor, driven by three blades, is directly linked to the generator, allowing for rotation at speeds varying between 18 to 38 revolutions per minute. Each blade has its own electronic pitch control system, which automatically adjusts the angle of the blades to the wind to maintain a constant power output. The gearless generators are designed with as few moving parts as possible and the absence of a gearbox means no possibility of oil leakages and no oil change. The Kupe Joint Venture is an integral part of the Company's business and provides a diversified source of revenue. Genesis, through wholly owned subsidiaries, has a 46% interest in the Kupe Joint Venture, which owns the Kupe oil and gas field that lies in the offshore Taranaki basin. Kupe is an integral part of the Company's business and provides a diversified source of revenue for the Company. Genesis is an active participant in the Kupe Joint Venture which gives it an opportunity to influence and share in any development of the Kupe oil and gas field. Kupe's assets comprise three wellheads, an unmanned offshore platform, a 30 km pipeline and subsea utilities umbilical cable to an onshore production station near Hawera, oil storage facilities at New Plymouth and an onshore gas pipeline. Kupe commenced commercial production in March 2010 and is an important part of New Zealand's energy infrastructure. It is expected to meet approximately 11% of New Zealand's annual gas demand and approximately 50% of New Zealand's anticipated LPG demand until 2025. Reflecting its 46% interest in the Kupe Joint Venture, Genesis receives 46% of the natural gas produced. It has also entered into long term contracts with the other joint venture partners to purchase the remainder of the current natural gas produced and has rights in respect of all future production of natural gas from the Kupe oil and gas field. Genesis sells natural gas to its retail customers in the North Island or uses it for electricity generation at the Huntly Power Station. The Company also sells surplus natural gas on the wholesale natural gas market. Genesis receives revenue from the sale of its 46% share of oil from Kupe. In 2012, Kupe produced approximately 11% of New Zealand's total production of oil and condensate. Approximately 95% of the oil and condensate produced in New Zealand in 2012 was exported. LPG is a secondary product of oil and gas production. Genesis receives 46% of the LPG produced by Kupe which it sells to its customers. We do not expect that significant additional electricity generation capacity will be required in New Zealand over the next three to five years. In the short term, Genesis Energy's focus is to maximise the efficiency of the Company's existing generation assets and fuel supplies, and to purchase from the wholesale market effectively, rather than to build new generation assets. However, the Company has a diverse portfolio of longer term generation growth prospects to increase capacity or to displace higher-cost generation in the future. These prospects include greenfield generation investments and opportunities for enhancing existing thermal, hydro and wind assets. Consistent with the Company's disciplined approach to the use of capital, these development prospects would proceed only if a project becomes economically viable. An example is the Castle Hill Wind Farm, where Genesis holds resource consents to establish a wind farm in the northern Wairarapa. The potential site is located 20km east of Eketahuna and Pahiatua, 20km north-east of Masterton and 15km west of the Wairarapa coast north of Castlepoint. It covers more than 20,000 hectares and the consents allow up to 286 wind turbines with a potential generation capacity of up to 860MW. Should this proceed, its scale is yet to be determined. The terms of the consents give Genesis until 2023 to begin construction. Arrangements for transmission have not been established. Resource consents were confirmed by the Environment Court for the Castle Hill Wind Farm in July 2013. CHWF is located 20km east of Eketahuna and Pahiatua, 20km north-east of Masterton and 15km west of the Wairarapa coast north of Castlepoint. Approval for the Castle Hill Wind Farm is required under the Resource Management Act 1991 (RMA). Further information about the RMA statutory process and timeframes can be found at www.mfe.govt.nz. On 1 August 2011, Genesis lodged resource consent applications for the Castle Hill Wind Farm ("CHWF") project with Tararua and Masterton Districts' and Horizons and Greater Wellington Regional Council's. These applications were accepted by all four Councils' as being complete on the 19 August 2011. The applications were publicly notified on the 29 August 2011 with submissions closing on the 26 September. 102 submissions were received. A joint council hearing commenced on the 28 November 2011 for eight days and a further four days commencing on the 24 January 2012. The hearing panel consisted of three independently appointed commissioners representing all four councils. They are Mr Philip Milne, Mr David McMahon and Mr Roger Lane. Following the adjournment of the hearing on the 27 January 2012 Genesis submitted its final evidence, right of reply and closing legal submissions on the 20 February 2012. The Commissioners released a preliminary decision on 13 April 2012 which set out tentative conclusions and provided Genesis the opportunity to provide further information. Genesis responded to the preliminary decision and requested the Commissioners issue a final decision based on the information before them. This is expected in early June. Genesis received the Castle Hill Wind Farm final resource consent decision on Monday 11 June. The Hearing Commissioners have granted all consents for the proposed development of the Castle Hill Wind Farm in the Wairarapa subject to some exceptions and conditions. Genesis, Castle Hill Wind Farm Comunity Action Group, Alfredton Education Trust and Board of Trustees of Alfredton School appealed the decision to the Environment Court. Discussions are continuing between the parties. Resource consents were confirmed by the Environment Court for the Castle Hill Wind Farm in July 2013. Read the full Media Statement here. Following the resource consents being confirmed by the Environment Court, Genesis has started planning for the next phase of the project. See Newsletter 6 for further details. Genesis, Castle Hill Wind Farm Comunity Action Group, Alfredton Education Trust and Board of Trustees of Alfredton School appealed the decision to the Environment Court. Discussions are continuing between the parties. See Newsletter 5 for further details. Independent Commissioners, appointed by four councils, released a preliminary decision on 13 April 2012 which set out tentative conclusions to the resource consent applications and provided Genesis with the opportunity to provide further information. A joint council hearing commenced on 28 November 2011 for eight days and a further four days commencing on 24 January 2012. The hearing panel consisted of three independently appointed commissioners representing all four councils. They are Mr Philip Milne, Mr David McMahon and Mr Roger Lane. Following the adjournment of the hearing on 27 January 2012 Genesis submitted its final evidence, right of reply and closing legal submissions in writing on 20 February 2012. The council evidence (officers reports) have been released and both the Regional and District Councils have recommended approval of the Castle Hill Wind Farm subject to recommended conditions. Genesis submitted its primary evidence for the upcoming hearing and is reviewing the recommended resource consent conditions and preparing supplementary evidence to address matters raised in the officers reports. Genesis supplementary evidence will be available at the commencement of the hearing. The hearing commences on the 28 November and is being held at Gateway Motor Inn, 290 High Street South, Masterton. The hearing is open to the public and anyone is welcome to attend. A hearing schedule will be available in the Horizons web site prior to the hearing commencing. 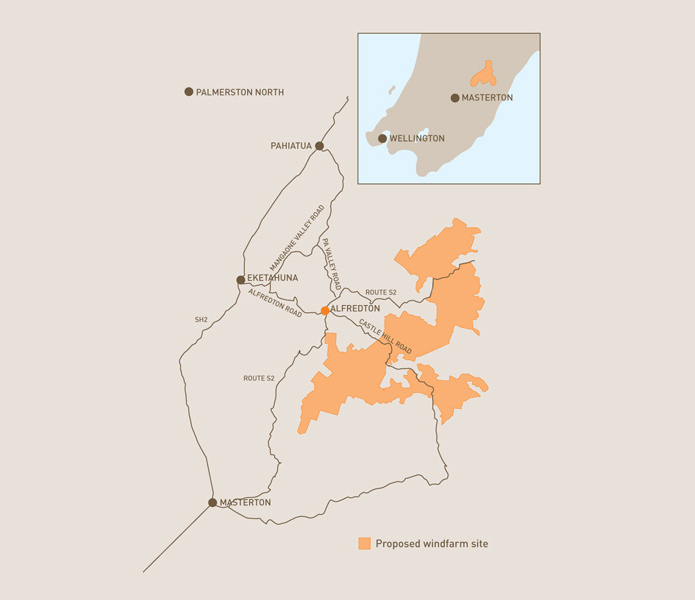 On 1 of August 2011, resource consent applications for the Castle Hill Wind Farm were lodged with Greater Wellington and Horizons Regional Councils and Masterton and Tararua District Councils. We are looking forward to the next steps in the process which will include public notification and submission period, council assessment and recommendation report and a consent hearing. See Newsletter 4 for further details. The second public open day for the Castle Hill Wind Farm was held on 1 and 2 April 2011 at the Alfredton Hall. The open day was an opportunity for the public to see the progress made since the last open day in September 2010, meet the team, learn about wind farm development and offer feedback on the proposal. Thanks to those of you who attended the open day. See Newsletter 3 for further details. The second public open day for the Castle Hill Wind Farm is being held on 1 and 2 April 2011 at the Alfredton Hall. The open day is an opportunity for the public to come and see the progress we've made since the last open day in September 2010, meet the team, learn about wind farm development and offer your feedback on the proposal. The first public open day for the Castle Hill Wind Farm was held in September at the Alfredton Hall. See Newsletters 1 & 2 below for further details. The inaugural Castle Hill Wind Farm ("CHWF") Community Liaison Group ("CLG") Meeting was held on 28 November, 2013 at Alfredton Community Hall, Alfredton. The CLG Terms of Reference ("TOR") will be developed prior to construction commencing on the CHWF Project. The Castle Hill Wind Farm (CHWF) Community Committee was established to oversee the allocation of community funds that were made available to it by Genesis following the signing of resource consent in 2013. A funding round was held in 2013 and 2014 to distribute the funds allocated to the Community Fund. If and when Genesis decides to commence construction further funding will be made available.